Are you an unpublished writer of children’s fiction or nonfiction, who is a person of color? It’s not too late to submit a manuscript to Lee & Low Books Ninth Annual New Voices Award. Submissions are still being accepted through October 31, 2008. See the Lee & Low Books website for more information. 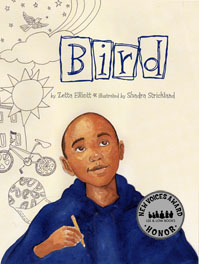 Congratulations to Zetta Elliott, whose book, Bird, was a 2005 New Voices honoree. It publishes this fall and has already racked up a starred review from Kirkus. From the Lee & Low website: Young Mekhai, better known as Bird, loves to draw. With drawings, he can erase the things that don’t turn out right. In real life, problems aren’t so easily fixed. As Bird struggles to understand the death of his beloved grandfather and his older brother’s drug addiction, he escapes into his art. Drawing is an outlet for Bird’s emotions and imagination, and provides a path to making sense of his world. In time, with the help of his grandfather’s friend, Bird finds his own special somethin’ and wings to fly. New Voices winners receive a $1,000.00 grant and a standard publishing contract. Honor winners receive a cash grant of $500.00. So polish off your manuscripts and mail them in! Thanks for this post. I didn’t know about the Lee & Low new voices award. I love the cover for Bird and the book sounds very good.